Download PDF This Southern classic has graced the Myers holiday table for as long as I can remember. 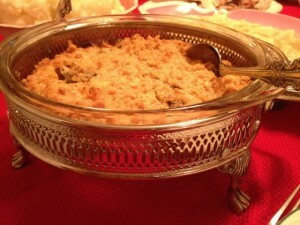 Oyster Dressing in all its glory on my Mother's Christmas table in the casserole dish that has held it my entire life! Now, with beautiful briny oysters plentiful all over (stick with the fresh ones from a really good fish counter), the true magic of this coastal classic can be had anywhere. The oysters are KEY, though. While we’ve made perfectly wonderful versions all over (thank you Whole Foods), this recipe truly blossomed with the amazingly sweet, plump oysters we got from Pike’s Place Market in Seattle. When you can see the water they came from as you pay for them, you’re likely in for a special treat! Enjoy this at your holiday table this year – did I mention it’s super easy? Drain the oysters, reserving ¼ cup of the liquid. Combine cracker crumbs, salt & pepper and butter. 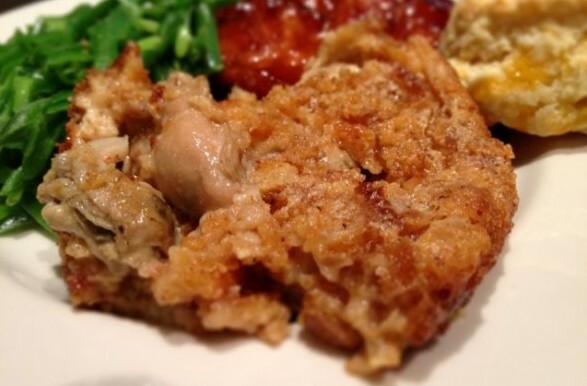 Put 1/3 of the crumbs in buttered 8″ casserole. Cover with half the oysters. Make a second layer (leave off crumbs on top). Beat the egg, oyster liquor and half & half. Pour over oysters. Top with remaining crumbs. Bake at 350 for 45 min, until puffy and brown and bubbly. Serve immediately while light and fluffy!